California Recovering from devastating wildfires. As California slowly recovers from last year’s devastating — and costly — wildfire season, a debate has ignited over the use of private firefighting teams deployed by insurance companies and used to protect homes belonging largely to the wealthy. The insurance companies offering this additional service are often for policyholders with properties valued at more than $1 million — and for homeowners with these insurance plans, having this extra protection can be the difference between their home surviving the fire and burning to the ground. Fred Giuffrida and his wife, Pamela Joyner, were home at their hilly 16-acre Sonoma ranch late last Oct. 8 when, looking out from the family room window, Joyner saw an ominous pink glow in the distance. It was a gusty night in wine country, so she went outside to get a better look. She smelled smoke. “Twenty minutes later, the whole hill was ablaze,” Giuffrida told NBC News. “There’s only one way off the hill, so we said, ‘We can’t afford to stick around here,'” Giuffrida recalled in a phone interview. After banging on the door to alert a neighbor, they fled their home in the early morning hours of Oct. 9, not knowing what they would find when they returned. That night, and for the next several nights, multiple wildfires ignited across wine country. All told, the “October Fire Siege” would destroy more than 245,000 acres — the most destructive in the state’s history. By month’s end, 43 people had lost their lives, 100,000 residents had been forced to evacuate, and an estimated 8,900 structures had been destroyed. Giuffrida’s didn’t realize his insurance company even offered firefighting services. Available for certain properties in wildfire-prone areas in California. The insurance company automatically sends its own “professional firefighters” to help protect homes before, during and after wildfires. 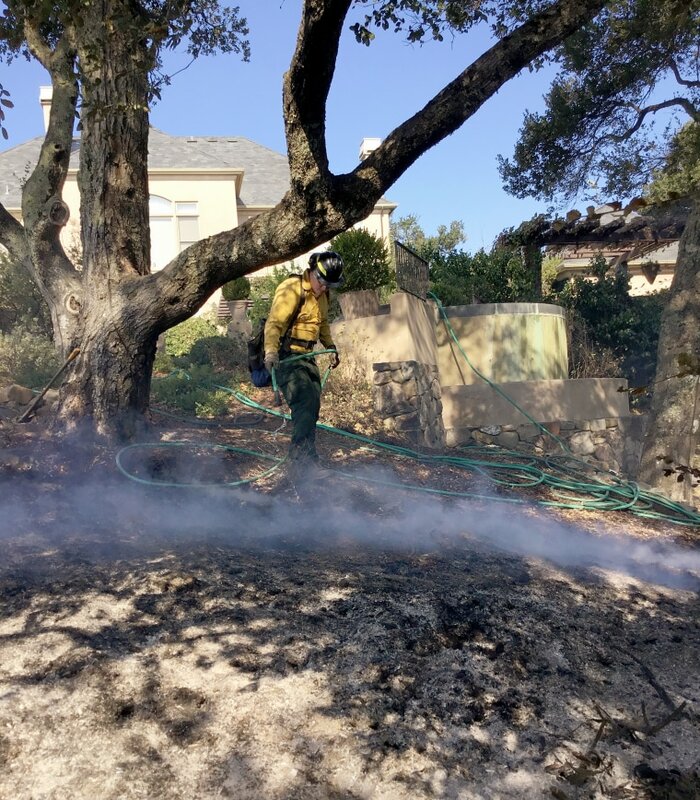 Like a growing number of insurance companies offering similar services, insurer firefighters can trim trees and move combustible material away from a home, spray it with gel or water and cover vents to prevent hot embers from getting inside a home. Although local firefighters were also on scene, this homeowner credits his insurance company’s private firefighters for saving his house. Over the course of five days when the fire threatened Giuffrida’s property, firefighters from other public agencies were also on scene. But Giuffrida credits the firefighters his insurer sent and their focus on his insured home for it still standing today. These firefighters, actually responders from Wildfire Defense Systems (WDS) that are contracted with his insurer, even sent him photos while they were on scene hosing down the fire. “They were fighting battles in so many places, so I think the fact that this supplemented it really saved our house,” said Giuffrida, noting that a few of his neighbors were not so lucky and did lose their homes. Insurers say; “Our specific goal is to work with policyholder structures,”. “We’re only allowed to access the properties that we’re given permission to access by policyholders,” he said, meaning that unlike publicly funded fire agencies, WDS makes determinations about which homes in a neighborhood it will defend from fire. Thousand Oaks Insurance proudly offers access to many leading insurers who offer private fire crew response. Visit our High Value California homeowners insurance page for details.